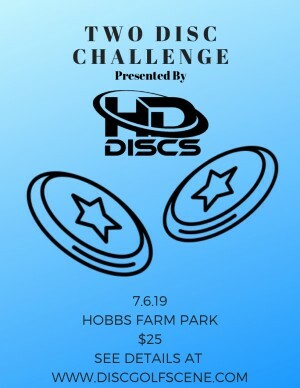 HD DISCS will be setting up shop for a 2 discs challenge at Hobbs Farm Park on Saturday, July 6th!! For only $25, players will receive a putter and another disc of their choice from HD DISCS inventory. We carry a lot of major brands such as: Discraft, Westside Discs, Lat64, Dynamic Discs, Prodigy, MVP, Axiom, Innova, Discmania and many more. It will be one round and you can only use the two discs you have chosen! Prizes are awarded to the top finisher in each division! Division: Advanced, Intermediate and Recreational!